Beeleigh mill was a large flour mill on the river Chelmer near Maldon, Essex. It had two water wheels driving 10 stones, to which was added a separate building which housed a steam-powered beam engine driving five millstones. The main building housing the water-powered wheels burnt down in a fire in 1875. 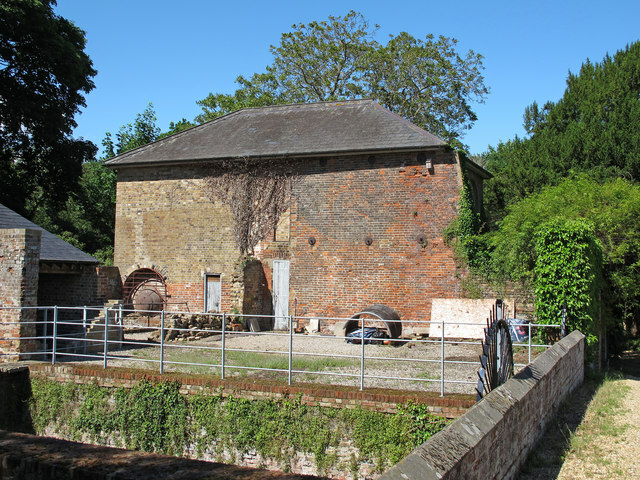 The site, which is Grade II*, now comprises the building housing the steam engine and the drive gearing for its millstones, the brick housing for one of the waterwheels, and the two adjacent brick-lined barge docks used for loading flour for shipment to London. 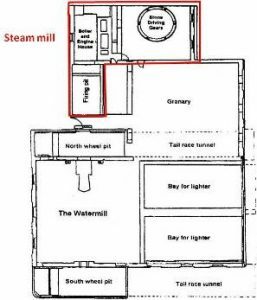 The steam mill is divided into 2 rooms, separated by a brick partition. The smaller north-western part is full height and contains the complete iron, double-acting Wentworth compound steam beam engine which was installed in 1845. Alongside is an ‘Elephant’ boiler with 2 safety valves and firebox. It is the only surviving example of this type of boiler in England, though it was more popular in France and Belgium. The ground floor of the larger room contains the drive gears including a circular-plan iron hurst with an iron upright shaft with great spur wheel, which drives each of the five pairs of stones. The upper floor has the emplacements for the stones. The drive shafts are in place, but the stones themselves are no longer there. Although not currently visible, a hide-out was built during WW2 under the floor of the steam mill for an auxiliary unit to hide should the enemy invade. Access was from a trapdoor in the building, with an escape route which came out in the tail-race tunnel from the nearer mill-race. After the war, this hide-out was filled in by the army.